The other penguins were aggressive towards this penguin than they were towards the normal colored penguins. It is always hard to be different. Chinstrap penguin with beige coloration instead of black. This coloration is called Leucism and is caused by a genetic inability to produce melanin. Only 1 of about 146.000 chinstraps is Leucistic (source: The Polar Times - July 2008). 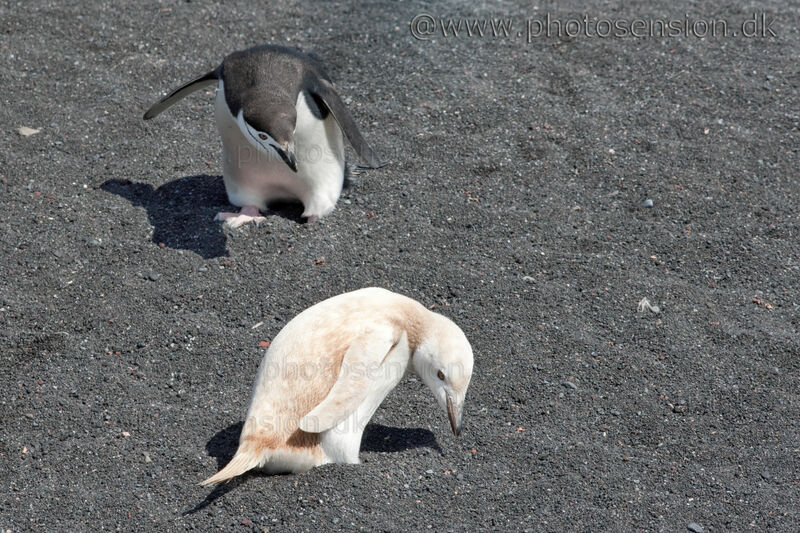 It is more common to see a leucistic Gentoo Penguin - 1 of about 20.000 individuals has leucism. This all-white coloration is called Leucism. Only 1 of about 146.000 chinstrap penguins is Leucistic. It is hard to be different.